Thanks so much for your business. Southgate Coins' goal is to provide you with excellent customer service from our courteous and accommodating employees. We try to go above and beyond to fulfill our customers' needs. Find out what our customers are saying about us by visiting our Testimonials and Yelp Reviews pages! If you have something to share about Southgate Coins, we'd be honored if you wrote us a review. We can be found on Google Places, YP, and Yelp. Please note, if for some reason you are not satisfied with our service, we urge you to contact us before reviewing, and we will do our absolute best to remedy the situation. If you have a legitimate gripe, tell us who you are and how we can make peace with you. We realize, however, that in spite of all of our best efforts and intentions there are persons who will choose hostility rather than reconciliation. "[This] underscores the darker nature of the internet that may be worsened by the anonymity under which its most abusive users tend to operate." To create a Yelp review, you will need a Yelp account. If you don't already have one, visit the signup page on Yelp. You can create an account from scratch, or link your Facebook account to Yelp. Make sure you jot down your Yelp username and password, as you may need them later. In your browser, visit http://www.yelp.com/reno and at the top, Search for "Southgate Coins." At the top of our business page on Yelp, you will see a red, "Write a Review" button. You will be directed to a new page, where you can assign Southgate Coins a star-rating based on your experience, and leave a review in the text box. To create a Google Places review, you will need a Google Account. If you don't already have one, visit this instructional page to create a Google Account. Please make note of the Google email address (username) and password you create—you may need them later. In your browser, visit www.google.com, and search for “Southgate Coins” in the main search bar. When the results page shows up, you should see lots of different links to things related to our business. On the right-hand side of the Google results page for Southgate Coins, you will see an image of our storefront, a map, and our business name in bold. Right below that, you will see text that says “Reviews” with a link below it that says “[#] Google reviews.” Click the “[#] Google reviews” link. This will open a window displaying our current reviews. At the top-right of this window, there is a blue “Write a review” button. Click the blue “Write a review” button. In your browser, visit the Southgate Coins YP listing. Scroll to the bottom of our listing (beneath all of our business information) to where you see other reviews posted for our business. At the top of the review section, you will be able to enter your review text in the blank text box, and assign us a star rating based on your experience with our company. When you are satisfied with your review text and star rating, click save. If you already have a YP account, it will immediately save to the Southgate Coins listing page. If you do not have a YP account, you will be instructed on how to create one (for free). Thank you for reviewing Southgate Coins! 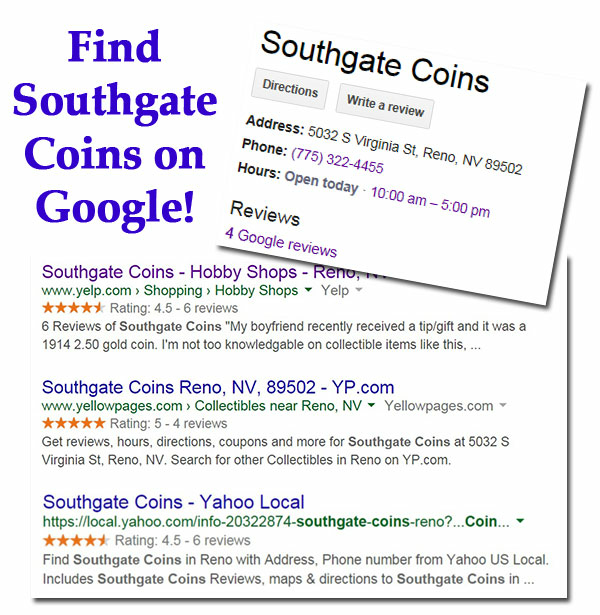 We love hearing what you have to say about Southgate Coins in Reno! Please contact us if you have any questions about how to post a review on Google Places or on Yelp, or any other questions or concerns about our products or services, and we would be happy to assist you.